Facts that everyone can agree on are the cornerstone of democracy and do exist - despite the rise of "fake news", a UK minister has said. Matt Hancock said it was "something of a disappointment" that he had to state publicly that "objective reality exists". But it was "incredibly important" to hang on to that principle in the "unregulated space" of social media. The digital minister was giving evidence to a House of Lords committee. He said the UK government was "concerned about the rise of what is called fake news" and there was "a lot of work to do to make sure we have reasonable objective information underpinning our democratic discourse". "Politics is a rough business and there is always going to be disagreement over the facts but having that objective reality... is incredibly important. "And thankfully in the UK we do have a regulated broadcast sector, which provides for a very significant proportion of trusted news." It was "very difficult" for governments to take action against fake news without undermining free speech, said Mr Hancock, and the best way to tackle it was through fact checking, education, transparency and other methods of "challenge". Facebook recently launched a tool to let people see if they have "liked" foreign propaganda posts. Mr Hancock said initiatives like this proved the social media giants were taking the problem seriously. But he added: "The social media companies themselves don't want to be the arbiters of truth and whilst I am unapologetic in thinking that objective reality exists the best way to find it is through challenge. "Would you want the big social media platforms themselves to decide what is and isn't true? And not allow things that they deem untrue to be put on their platforms or published?" Mr Hancock also hit back at claims the UK government, or any national government, was powerless in the face of giant global corporations like Facebook and Google. He said the UK was "leading the world" in "how to make sure that ultimately the internet is a force for good in the world rather than a free-for-all". 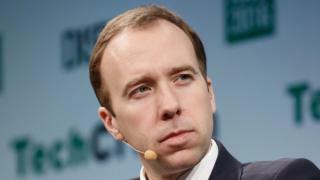 The UK government's attitude had shifted from a "libertarian" approach to the internet, he said, to one which promotes freedom but "also involves mitigating harm".